The Chicco Physio Soft Pacifier, besides reducing the risk of SIDS (Sudden Infant Death Syndrome), plays also an important role in proper oral development. It must be designed to fit perfectly the baby's mouth, ensuring correct, uniformly distributed pressure of the tongue on the palate. The ideal teat should be: Orthodontic. Physiological, designed with a shape and features which do not hamper the natural functions of the mouth. Thin at the base, to prevent dental problems.The Orthodontic Physio Teat, combines all the necessary features to facilitate the proper development of the baby's mouth. Tiny Ridges- Encourage the natural positioning of the tongue inside the mouth. Grove And Angled Shape- Promote uniform distribution of tongue pressure, favouring correct development of the palate. 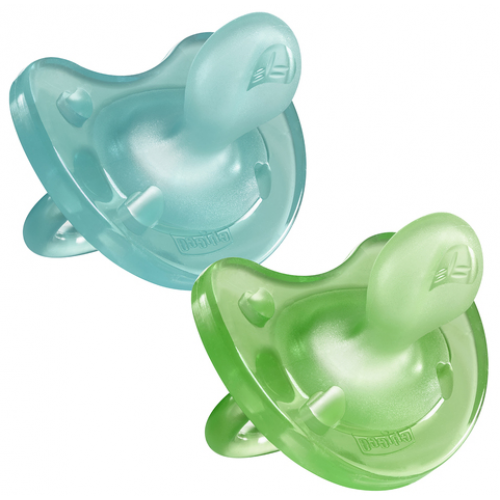 Super Thin And Soft Base- Ensures proper closure of the baby's mouth.